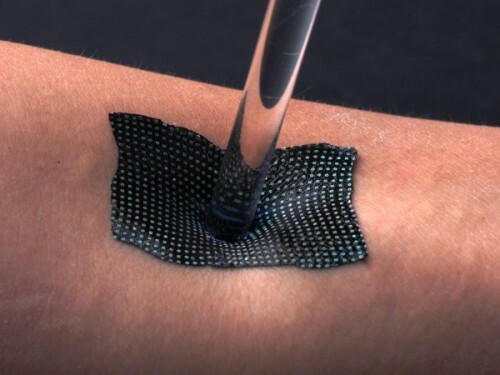 An almost invisible, wearable medical device that monitors your cardiovascular health, and lets you know when you need to moisturize your skin, has been invented. This ‘epidermal’ photonic sensor is also a potentially cheap alternative to the expensive infrared technology currently used in hospitals. It consists of an array of up to 3,600 liquid crystals, each half a millimeter square, laid out on a thin, soft and stretchable substrate, along with a built in wireless heating system, powered by electromagnetic waves in the air. The liquid crystals change color when they detect temperature changes in the surface of the skin, giving a snapshot of how temperature is distributed across the device, and determining the blood flow rate. An algorithm uses this blood flow rate data to assess both cardiovascular health and skin dryness in seconds (the thermal conductivity of the skin changes when it is dry). Yihui Zhang, the co-first author of the study published in Nature Communications, and research assistant professor of civil and environmental engineering at Northwestern, claims the ultra thin 5cm square device can be worn 24/7, as it twists and stretches in response to the natural movements of the skin. Although it will be a long time before it’s available on the market, it already make other wearable health and fitness devices on the market appear clunky and ugly in comparison. As well as being of relevance to people who want to monitor their cardiovascular health, it seems that this device could be of huge interest to cosmetics companies. The ability to alert a person to their level of skin dryness and recommend appropriate products, as well as send notifications when products should be applied, could be of huge interest to the growing number of people who are interested in maintaining their youth. If they can also monitor their cardiovascular health, it’s a win-win.